Doesn’t it feel good to be a pure Google device, even more when you’re part of the beloved line of Nexus smartphones? 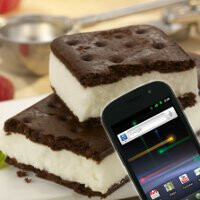 Well, if you happen to own a Google Nexus S, you’ll be elated to know that Android 4.0 Ice Cream Sandwich is coming to you very quickly – that’s if you own a GSM variant of the handset. The good news came directly from big Google themselves, as they specifically mention that GSM/UMTS variants of the Nexus S will be getting the tasty ICS update starting today – with the roll out expected to go on throughout the course of this month. Obviously, that spells wonderful news to the AT&T and T-Mobile versions of the handset, but as far as the Google Nexus S 4G for Sprint is concerned, it’s anyone’s guess still on when it’ll get the anticipated update. Clearly there are going to be a lot of people around the world, but let’s see how long it’ll take some of the other manufacturers to bring venerable Android devices up to spec. In any event, you’d better keep a close eye on your handset to see if that nifty notification has landed. Plz plz plz ics on the g2x before Christmas. Idc if its cm9, another rom, or an OTA update. But please give me ics. But this isnt Samsung own phone it's google baby! to those idiots thumb me down what's your problems? period?! Samsung said 18 months for the release of ICS, but they also said on the 14th that the GNexus wouldnt come out on the 15th but by the end of the month, and the very next day they launch it. Seems like its anyones guess but i doubt it would take that long. In 18 months whocknows what new devices will be on the market. I know i wont have this new GNexus for that long. this ota update for nexus s GT-I9023 ?? worldwide ?? IF I HAVE TO WAIT 18 MONTHS TO GET MY SGS2 EPIC UPDATED I WILL GET A SGS3 WHEN IT RELEASES!!!!!!! Just update mine to ics this morning. Btw i from Malaysia Just awesome !!! !